Related in a sense to relative size but a depth cue in its own right is what has been termed texture gradient. Most surfaces, such as walls and roads and a field of flowers in bloom, have a texture. As the surface gets farther away from us this texture gets finer and appears smoother (Gibson, 1950). The picture at the top of this page attempts to illustrate texture gradient using circles such as in a cobblestone road. At each level, as the cobbles get smaller, it gives the impression that the circles are getting farther away. The animation to the right makes this point even clearer. Watch it go through a few cycles. When the small squares actually look square, The image looks to be like a wall rising up before us. When the texture units stays the same size and no depth is indicated. This outcome can be seen both at the beginning of the animation and for the top part of the pattern at the end of the animation. However, when the spaces are shaped so that the top is smaller than the bottom and the sides tilt in towards the middle then the pattern appears like a floor receding in depth. So when the texture units change in size then depth is indicated. In this case the depth of a surface like a floor spread out before you. 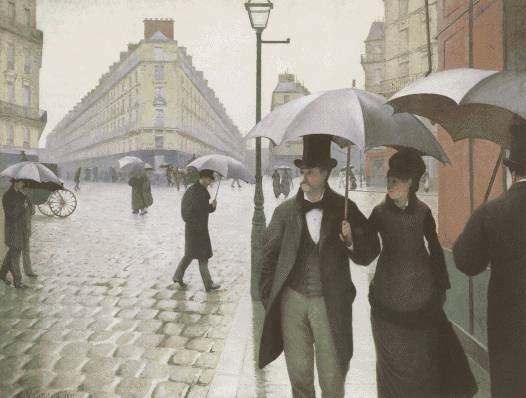 Paris Street: A Rainy Day by Gustave Caillebotte Texture gradient is carefully used in the painting to the left, Paris Street: A Rainy Day by Gustave Caillebotte which was used in the discussion of linear perspective. In this case focus on the street and how it appears to recede in depth. The square cobblestones are the key in this painting. These cobblestones get progressively smaller as the road recedes in depth until the stones are not clearly distinguishable from each other. In the distance, only the general roughness of the street is noticeable and then this roughness becomes less easily noticed as well. A surface or field that recedes in depth has a texture that gets finer. That is very different from a wall where the surface is approximately the same distance from a person at all points. For example, imagine yourself standing and staring at a brick wall which, instead of receding in depth like a cobblestone road, rises up in front of you. Here the texture, in this case the brick alternating with the mortar, will have about the same roughness all over the surface and provide a clue that the surface does not recede in depth. In addition, texture may play a role in helping us determine the size of an object. Regardless of how far an object is away from us, it covers roughly the same amount of surface, and thus texture, which can help us determine the actual size of an object (Gibson, 1950).